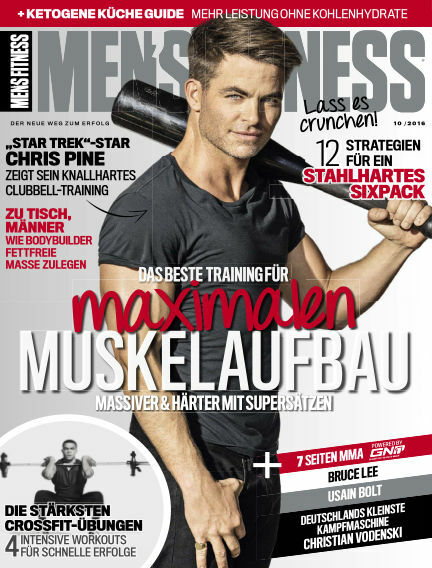 In this issue of Men's Fitness DE : MEN’S FITNESSS is for men who want to get more out of their lives. It celebrates an upbeat, optimistic, pro-active lifestyle and recognises that every man carries the key to living more successfully, enjoyably and completely. MEN’S FITNESS knows that mental and emotional fitness is vital to balanced living and aims to offer active and aspirational men entertainment, information and inspiration. With Readly you can read Men's Fitness DE (issue Issue 71) and thousands of other magazines on your tablet and smartphone. Get access to all with just one subscription. New releases and back issues – all included.